Multi-Stage Lift Tables are designed to travel higher than standard lifts within a smaller platform and base size at the expense of increasing the collapsed height. 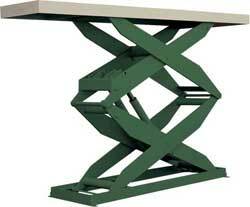 Primary applications are those which have small footprint / platform requirements or raised heights exceeding 60 inches. In order to overcome the increased collapsed height, many multi-stage lifts are pit mounted. Double High 1,000 - 12,000 lbs 48" - 144" 10" - 24" 61" - 168" 24" x 36" 72" x 132"
Triple High 1,500 - 6,600 lbs 72" - 216" 14.25" - 54" 86.25" - 270" 24" x 36" 84" x 144"
Quadruple High 3,000 - 6,000 lbs 240" - 288" 54" - 68" 294" - 356" 60" x 96" 84" x 144"